The French Army of the Great War was a huge conscript army which proved capable of more than doubling in size in the first few weeks of the war. As the Germans crossed the borders of Alsace-Lorraine the Battle of the Frontiers began and more and more troops needed to be shipped to the front. 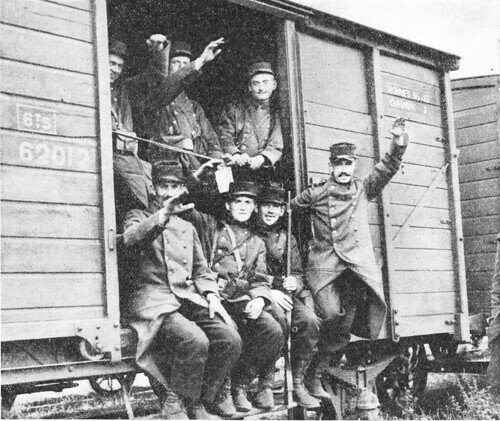 This image from a French source shows soldiers in a railway carriage cheering as they begin their journey to the battlefield. France’s response to war in 1914 was rapid and successful, but costly – more than 300,000 French soldiers would be killed before the year was out in just a few months fighting. The railway carriage they are sitting in was the standard used by French railways; it bears a famous inscription which would become well known to British troops ‘Hommes 40, Chevaux 8’; 40 men or 8 horses. It was painted on all these wagons and troops remembered it as a lot more than 40 British soldiers were usually packed inside! This entry was posted on 19/09/2012 by sommecourt. It was filed under France, French Army, French Front, Great War, Western Front, WW1 and was tagged with 1914, French Army, French Front, Railways.